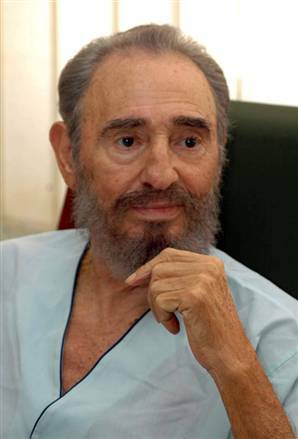 In the parlance of Texas hold'em, Stone is telling Rabattini I'll see your Hitler and raise you a Castro. Now, sharp-eyed operatives will undoubtedly observe, that in the hierarchy of demonizers, when it comes to invidious comparisons, Fidel Castro is no slouch. However, even Castro does not approach Adolf Hitler, who in the pecking order of defamatory signifiers, is still the H-bomb. And true enough. However this is a weighted contest, so a couple of qualifiers: The difference between Buffalo Grove and Island Lake is the difference between well-heeled-Winnetka and back-woods-Johnsburg. Moreover Stone wasn't merely venting on some marginally relevant Internet blog. Stone's remarks were on the record -- directed toward Buffalo Grove elected officials during a village board meeting. In related news, look for the LakeCountyEye Political Demonizer™ with the all-new adjustable Castro beard™ Web Widget. Coming soon! Well, put. I wish this wasn't such a source of amusement. The last thing we want or need in BG is more drama regarding Ms. Stone's antics. Her Castro comment is funny on several levels, not the least of which is that she couldn't find Cuba on a map if her life depended on it. Also, I believe SHE might be more dictator-like than any other elected official in the area. After all- didn't she file a lawsuit to get the name of an anonymous internet critic? Isn't she the one who tried to press charges against a former trustee over a minor bumping incident at a charity baseball game (even her friend said it was a non-issue, but Stone wanted to have the guy artrested for assault or something) and didn't she recently try to shout down a resident who criticized her at a board meeting? Also, hasn't she been trying to deny businesses (like off-track betting) from setting up shop in the village? Now THAT seems more like Castro, doesn't it? Watch the fireworks over the next few months as the recall effort picks up steam. If you'd like to write one, we're happy to post it.